Starting off with a sweet entree because I love having sweet stuff 24/7. The compote are well-sweetened with the chantilly cream well whipped and fresh. The whipped cream, though, adds small value to the great dish. It merely provides a flare of extra flavor. 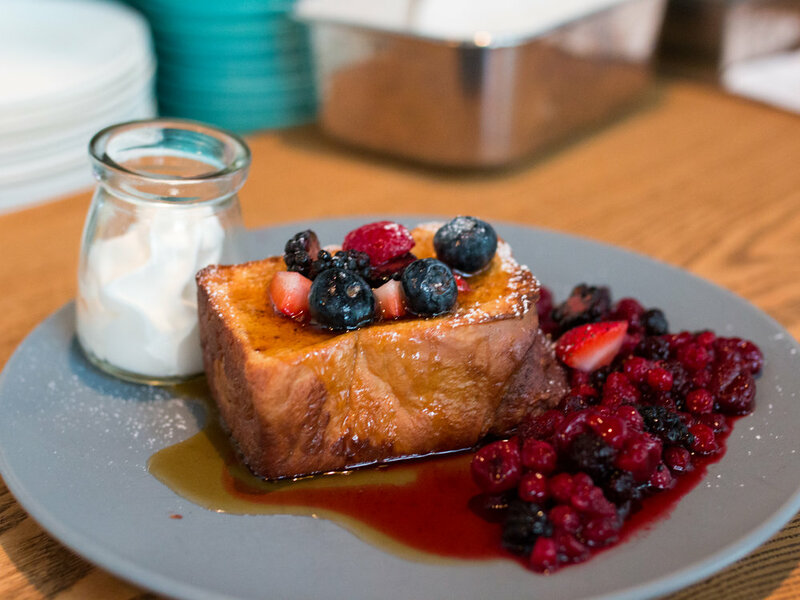 The French Toast itself was well cooked with the sides brimming with browness and the inside golden. It was chewy and soft and I cannot have any complain with the price tag that comes with this dish. Great value. B.E.L.T., I actually forgot to ask what this actually stands for but I guess something to do with the fantastic, fatty and mildly-crisped bacon. It did not taste like your normal wake-up beacon that you cook right before class or work, but more pork-like bacon. The sunny-side egg, however, has stolen the show. Aesthetically somehow they manage to balance the egg perfectly on the bacon and is greatly pleasing to the eye.The salad dressing though, is a little lacking but the egg yolk does make up for it. Shomhow I'm usually not a fan of apple tarts but this surprised me for sure. The gala apple was an excellent choice to complement the crispy and hard-tart. Mildly sweet with the soft-chewy texture complex, the apple is hidden inside the tart, waiting for you to bite into the special tart and taste the layers of wonder. The ice-cream (should be vanilla) is a great plus that adds more flowing sensation / taste to the dish. Must-try. A little hard to find since it is a bit far away from everything (not exactly in the center of the city). Thus the name "Deadend" is especially fitting and it does reflect the fun they are having with their restaurant. You can expect great service with a dedication to quality, not just quantity. It used to be very full (and with a line) but this place is now great for sitting down for a chill brunch with friends. Be patient though, this place is definitely worth the visit. There are a lot of restaurants and cafes nearby as well as we uncover more in the following weeks.